Summertime is the best for so many reasons. School’s out and it’s time for vacations. There are lots of summer camps for adults and kids. 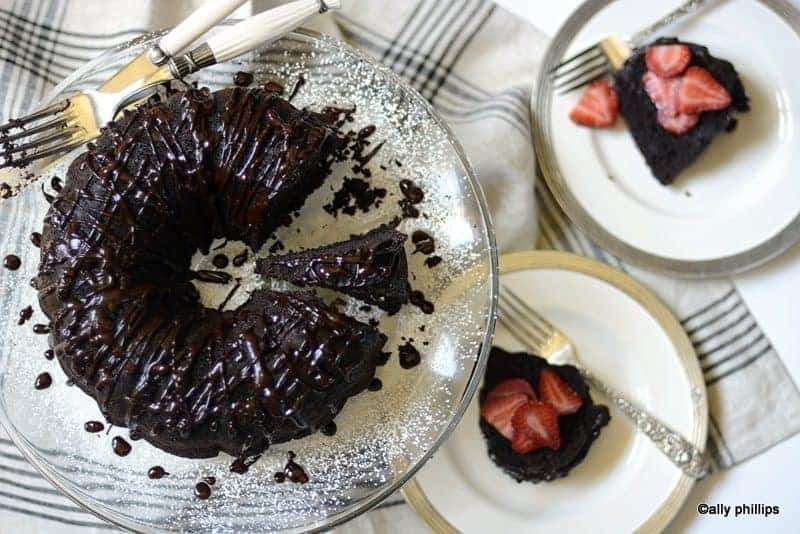 Summer is a time for picnics, cookouts and more outdoor grilling and barbecuing. Summer’s also the season of harvest. From small gardens grown in pots to large farms, fresh vegetables and fruits and coming in. One of my favorites is corn. Yes, sweet corn on the cob. Whether it’s Silver Queen, yellow, white, Olatha or whatever, there’s nothing better than freshly shucked corn that’s been steamed, boiled, grilled, cut off the cob. Now, corn is good just with butter and salt and pepper. 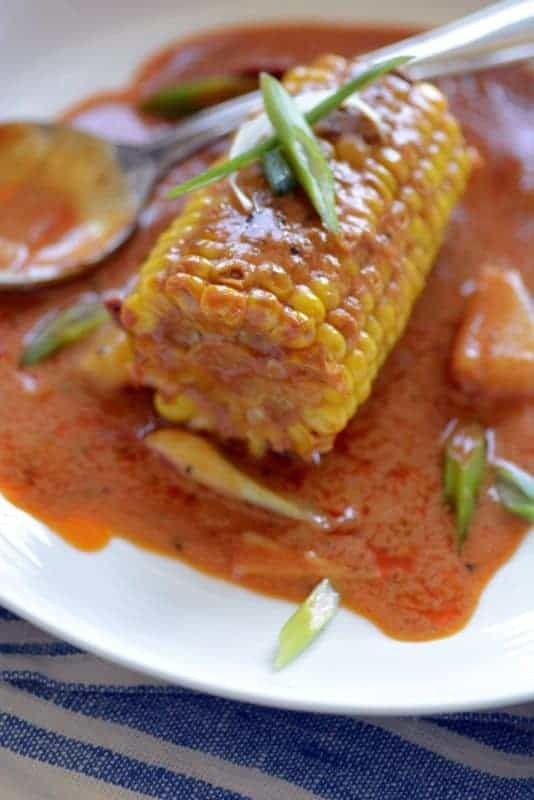 But, sometimes you really want a change and that’s what this thai red curry coconut corn is. 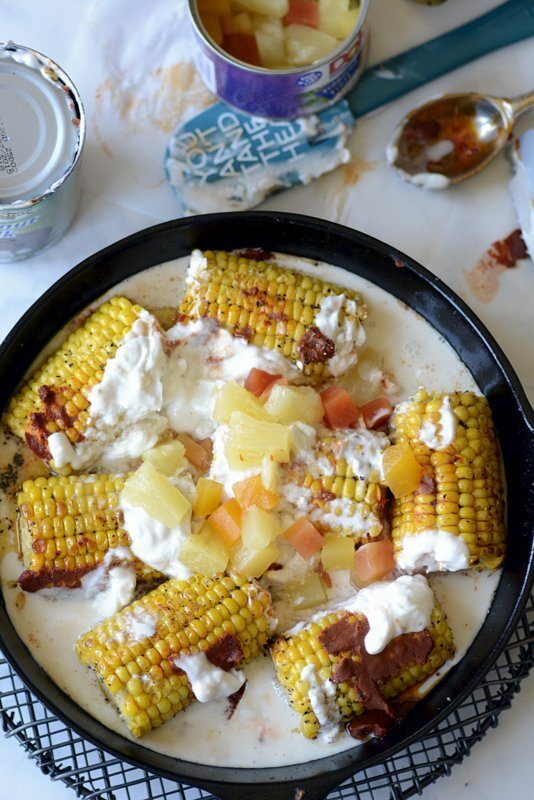 A spicy tasty and messy way to change up how you fix that glorious corn on the cob! 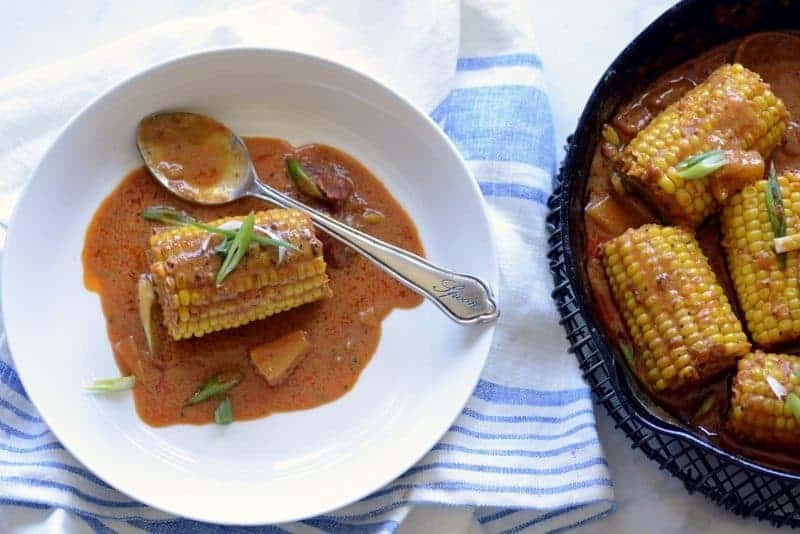 What makes this corn ever so unusual is that it bathes in a sauce of thai red curry sauce that’s spiked with the freshness of tropical fruit and the natural juices that it’s canned in. That combination of flavors creates an explosion on your palate as you bite into the plump juicy corn. Those little kernels burst open and you have Mother Nature’s best and also the unexpected flavors of coconut milk, fruit and thai red curry. Yes, there is messiness when you eat this corn. But, it’s worth all the finger lickin’ and lip smackin’ effort! If, by chance, you want to bypass this messiness, just cut the corn from the cob, and pull out your spoons. Yes, it will be very proper and without worry of a mess. But, you’re missing rolling that clean cob in the thai red curry sauce and then sucking some more of the sweet corn juices from it! In an 8-10” cast iron skillet over medium high heat, melt the butter. Add the corn and pan sear about 3 minutes turning the corn to get browning. Sprinkle on the pepper. Add the red curry, coconut milk and tropical fruit. Blend as the mixture heats. Reduce heat to medium keeping a simmering boil. 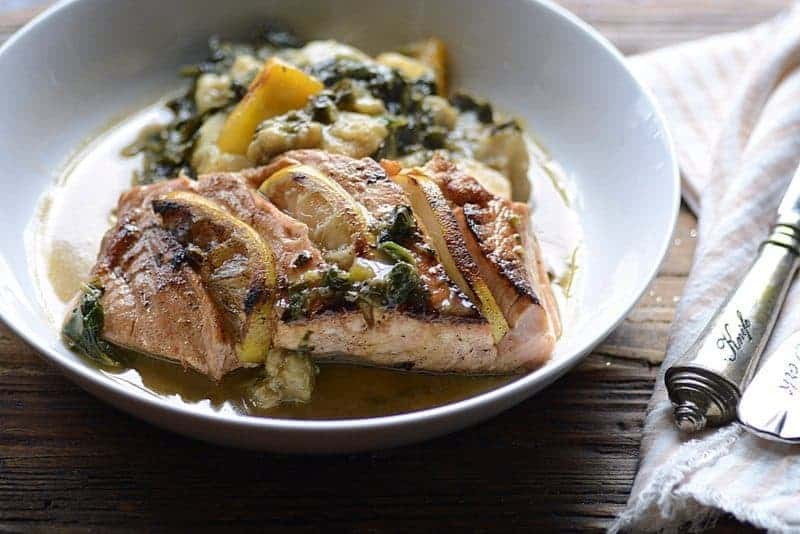 Cook for 20-22 minutes. Sauce will thicken. Different brands of Thai Red Curry paste can vary in heat intensity. I would suggest tasting your red curry paste for 'heat' level and adjusting the amount accordingly in this recipe. The Dean & Deluca Thai Red Curry brand was 2.5 ounces. I used it all because it wasn't that spicy. 2.4 ounces is about 5 tablespoons. 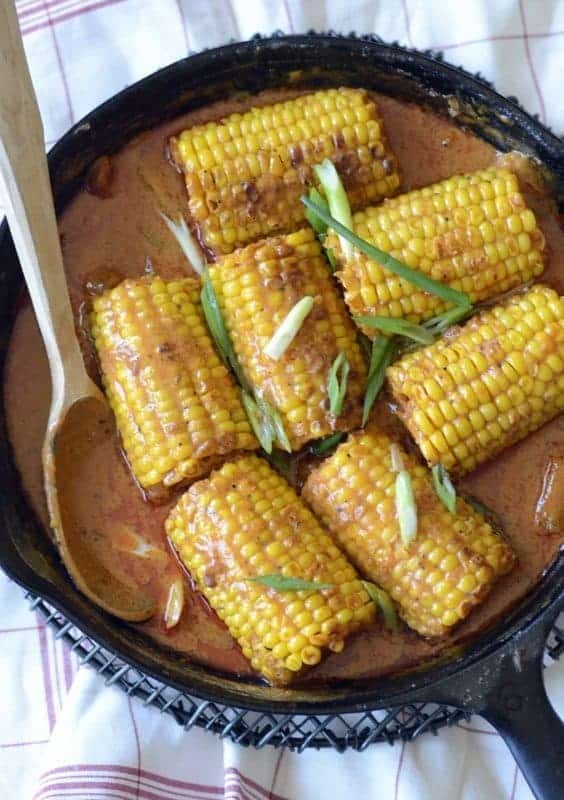 Never thought of putting curry over corn, but I bet it’s so good! Those tropical fruit and seasonings sound good!